A long-standing question in astrophysics is: how and when did supermassive black holes appear and grow in the early universe? New research using NASA's Chandra X-ray Observatory and the Sloan Digital Sky Survey — called the SDSS — suggests that an answer to this question lies with the intermittent way giant black holes may consume material in the first billion years after the Big Bang. To address this conundrum, an all-female team of researchers examined different theoretical models and tested them against optical data from the SDSS and X-ray data from Chandra. Their findings indicate that black hole feeding during this era may turn on abruptly and last for short periods of time, which means this growth may be difficult to spot. The timing of such growth may be key. The authors' model suggests that 13 billion years ago, about one third of supermassive black holes may have been accreting enough matter to be detectable. Just 200 million years earlier — a veritable blip in cosmic time — the number of potentially detectable black holes is only about 3%. In order to test this idea further, the researchers suggest that surveys with Chandra and future X-ray telescope that look at larger areas of the sky in X-rays are necessary. 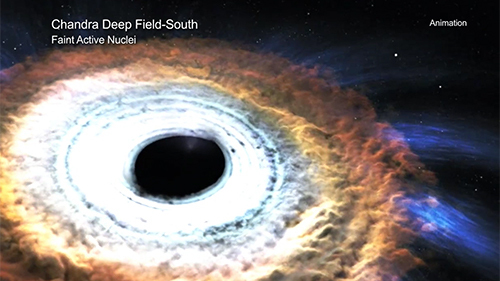 Scientists would like to learn about the earliest supermassive black holes in the Universe. 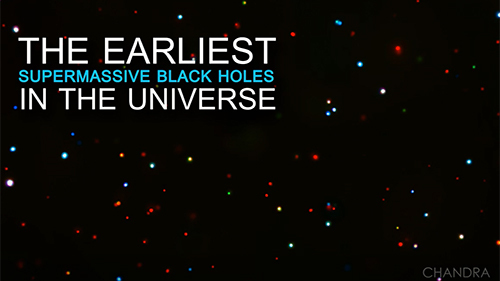 Supermassive black holes can contain millions or even billions of times the mass of our Sun. Astronomers find evidence for these giant black holes about a billion years after the Big Bang. The question is: how did they get so big so quickly? An all-female team of astrophysicists using X-ray data from Chandra, optical data, and theoretical models is tackling this question. This "herky jerky" growth may be the key to understanding the origin of these gigantic black holes.